Recently, I had a great encounter. I didn’t expect to meet this person in Mongolia, the person who I would say is well-known to the majority of Japanese: Mr. Hirotada Ototake, the author of “No one’s perfect” (in Japanese, Gotai Humanzoku which literally means without limbs). 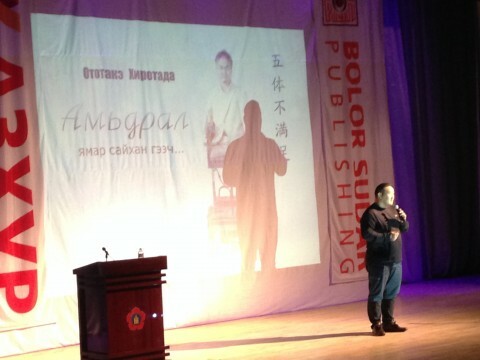 He came to Ulaanbaatar, Mongolia to an event for opening new bookstore branch and introduce his book translated into Mongolian. Furthermore, at this event, Mongolian national iconic person, Asa Shoryu (previous sumo wrestling Champion in Japan) was also present, so it was double unexpected encounter for me. The book “No one’s perfect” (published 17 years ago when he was a college student) became the 2nd best seller book in Japanese post-war history (around 6 million copies). Actually I knew about him since the book was published because it was pretty big deal in Japan back then, but I had never read his book until last year. 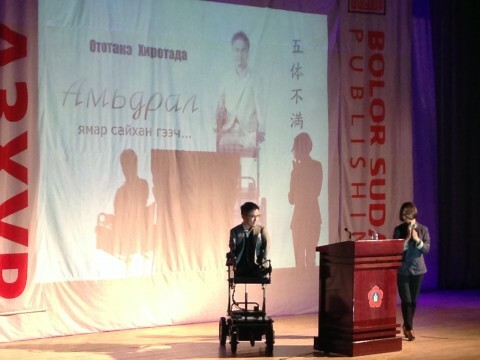 At the event to celebrate book store branch, I think audiences (mostly Mongolian) were very inspired by his life story as well as people who supported him from his birth. He had his mother who said to him “cute” when she saw a baby without legs and arms for the first time. He had a teacher who was strict to support him to become independent person. He had many friends who cared about him and played with him. Lucky, his environment was very inclusive. In Q&A time, I had a chance to ask some questions to him after his moving story. Thanks for telling your heartwarming life story. I have some questions regarding inclusive education (everyone stduy in a same classroom regardless of disabilities or other factors). Before getting into the questions, let me tell you that the fact I saw you tonight may be some kind of destiny. On the other side of the planet, Chile, I was involved in Inclusive Education project. Then I moved to Japanese embassy in Chile where I found and read your book for the first time. Then I came back to the other side of planet, Mongolia, and I could see you here tonight. Regarding my question, I think it needs more works to promote inclusive education here in Mongolia, too. 1. What do you personally think about Inclusive Education? 2. How do you think Inclusive Education can be promoted in Japan or other countries ? 3. What can people without disability do for more inclusive society? 2. How do you think Inclusive Education can be promoted in Japan or other countries? The event ended with everyone’s applause, and I think he planted a seed of change in Mongolia, and his book translated into Mongolian will promote it further. 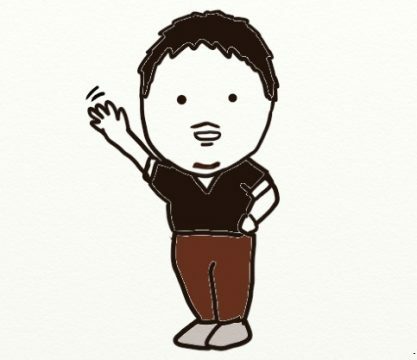 By the way, in the Q&A time, Asa Shoryu (previous sumo champion) also asked one question, which was asking him to go to hot spa together. I guess he just wanted people’s attention, though. This entry was posted in Inclusion, Japan, Mongolia and tagged inclusion, Inclusive Education, Japan, Learning, Mongolia on October 3, 2015 by MD.